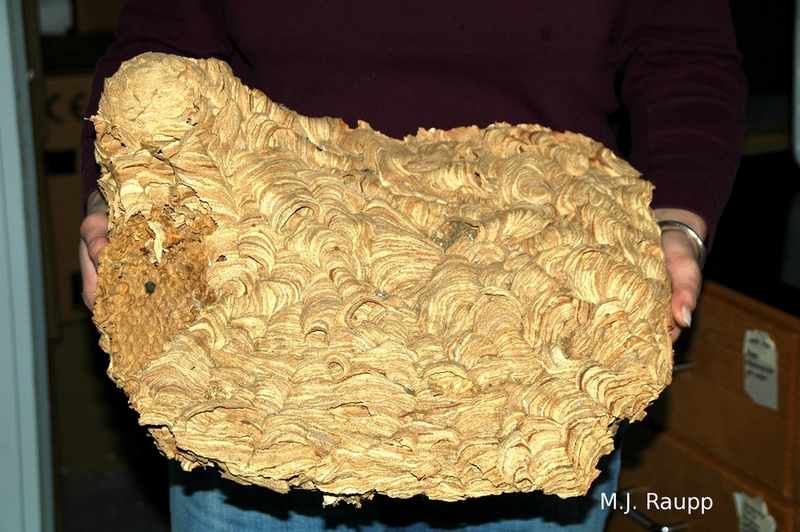 This spectacular European hornet nest was recovered during a home renovation. Over the last week or two, I have heard strange reports of giant yellow-jacket like wasps attacking shrubs. A quick visit to one of my victimized neighbors revealed a small horde of magnificent European hornets stripping the bark from a lilac and greedily lapping exudates leaking from the wound. To construct their beautiful paper nest, European hornets strip bark from several types of trees and shrubs including lilac, rhododendron, and birch. Apparently, this annoying behavior provides the material for making paper and allows them to feed on the nutritious sap and plant tissues beneath the bark. Unfortunately, small plants may be severely damaged by this bark stripping. European hornets first appeared in the United States in New York sometime between 1840 and 1860.These marvels spread and now occupy territory from the east coast to the Mississippi. In nature these giants use a cavity in a tree for constructing a nest, but occasionally, as was the case with another neighbor, hornets will nest in the wall void of a home or barn. The colony is founded by a single queen that survives the harsh winter beneath the bark of a fallen log or in another protected location. In spring when warmer temperatures prevail, she will become active, gather bark from a tree, construct a small paper nest, and lay eggs destined to become workers. After the queen successfully raises her first batch of sterile female workers, she remains in the nest producing brood while her daughters take up tasks of enlarging the nest, protecting it, and gathering food for the young such as caterpillars, flies, grasshoppers and other stinging insects like yellow jackets. In addition to eating other insects, they feast on fallen fruit. European hornets are somewhat unique in their foraging behaviors in that they hunt at night. They are also attracted to light and can be found buzzing around porch lights or heard crashing into windowpanes after dark. During autumn, the colony operates at a fevered pace. Inside the colony, the queen no longer produces sterile daughters. She has shifted production from workers to female and male hornets capable of reproducing. Females are destined to become queens of future generations. Males have just one purpose and that is to mate with the new queens. After fulfilling this biological imperative, males die. As autumn wanes, the colony is abandoned and queens find protected places to spend the chilly months of late autumn and winter. The nest will not be reused in subsequent years. Although these hornets are large and scary looking, humans are unlikely to be stung by European hornets. I photographed hornets at a very close range and other than receiving an inquisitive stare, I was unmolested. To avoid being stung, simply avoid disturbing the nest site or the wasps. If European hornets have nested in a home or another location that poses a threat to human health or safety, they may be exterminated and assistance from a professional may not be a bad idea. However, if the nest is out of harms way, I favor the approach of my neighbors who had a “live and let live arrangement” with these giants that had taken up residence in a wall void of their home. Special thanks to Harry for alerting me to the hornets in his lilacs and to Brooke and Ruth Ann for sharing their ginormous hornet's nest for this Bug of the Week. For more information on these interesting insects, please visit the following web sites.